Well, we got rain this morning which was nice except it poured pretty hard, I would rather it was slower. At least I get a bit of a break from watering my new plants. 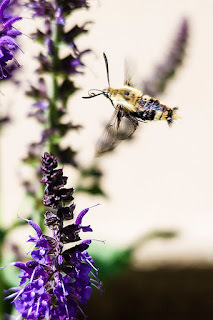 😄 I saw this guy flying around and enjoying the Salvia last week. I believe it is called a Snowberry Clearwing Moth. It was fun to watch it hovering around and drinking nectar with that long tongue.